The new book including all essential information on Habanos and its brands has just been published in Spanish and English. The new book “The World of the Habano”, with contents prepared by prestigious specialists from Cuba and from the rest of the world, will be available in the next few weeks in English and Spanish in different Habanos sales points all over the world. Its contents include, in the first place, a whole process of Habano making, starting with the cultivation of the tobacco plant in the prestigious region of Vuelta Abajo – World’s best tobacco zone – to the “Totalmente a mano” ‘-Totally handmade- cigar rolling in Cuba’s historical factories, elements that distinguish the Habano for its exclusiveness. The more than 500 manual processes undergone by the tobacco leaf until its transformation into a Habano are described in its pages. Also included in the book is a chapter on the 27 brands of Habanos currently in production, from the mythic Cohiba to the historical Montecristo, Romeo y Julieta and Partagás and other prestigious Habanos brands such as Trinidad, San Cristóbal de la Habana and H. Upmann. Other interesting and novelty chapters are also included in this essential material, like, for instance, on the ageing of tobacco leaves before a Habano is made and about the ageing of a Habano itself. The book could not omit chapters on the exclusive Habanos Festival celebrated every year in Cuba and information on the best sales points throughout the world, like the franchised stores La Casa del Habano and Habanos Specialists. All book copies bring a CD multimedia on the inside cover which gives the reader the possibility of consulting The World of Habano in digital format, and also provides a quick and easy searcher for the updated Complete Guide of Habanos present in the market. 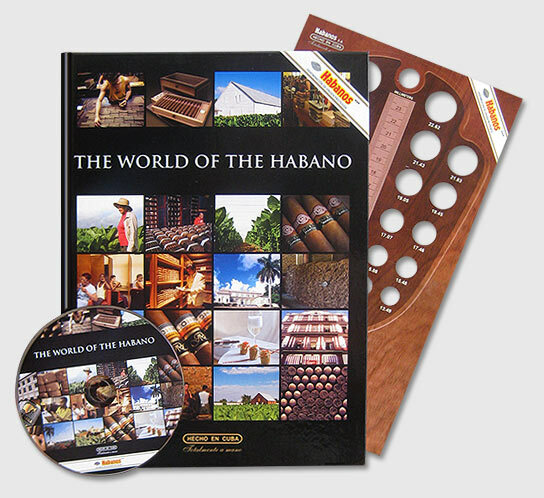 As a novelty, the CD includes a link to the video film website http://www.archivohabanos.com where a large number of videos related to the Habano may be downloaded. “The World of the Habano”, a material protected by the Regulatory Council for the Protected Denominations of Origin (D.O.P. by its Spanish acronym) is available in many countries. In case you are interested in more details, please contact your regular Habanos sales point for further information. Here you can see inside the Spanish, English, German, French, Italian, Portuguese and Dutch versions. Chinese and Russian versions will be published progressively in the upcoming years.